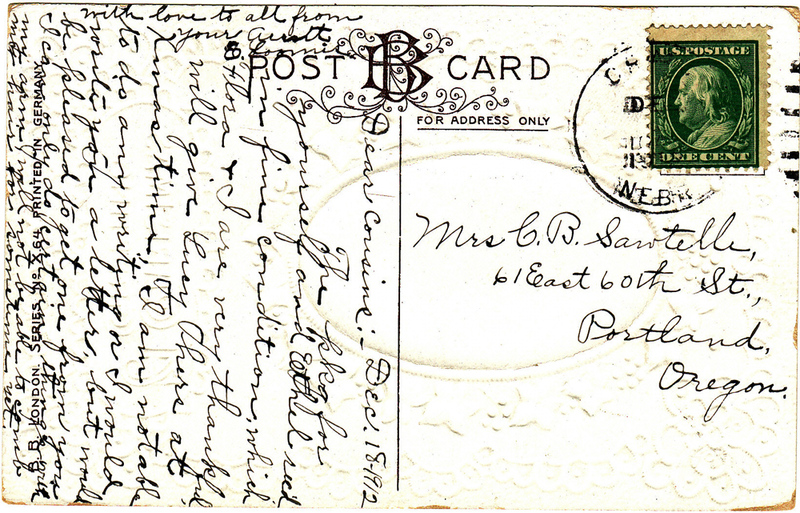 I like how this Christmas postcard from 1912 recreates the look of a lace doily. Very intricate and pretty. This was sent from what looks like Nebraska to Portland Oregon on December 18, 1912. Have you finished your Christmas shopping yet? I am seeing emails that say "last minute presents" and it's freaking me out. I just got started. The holiday season goes by so fast. I did a little post on the PonyBoy Press blog about using copies of old family photos for Christmas tags. You an also use copies of your favorite Christmas postcards and cards. Here are a few I made just now. 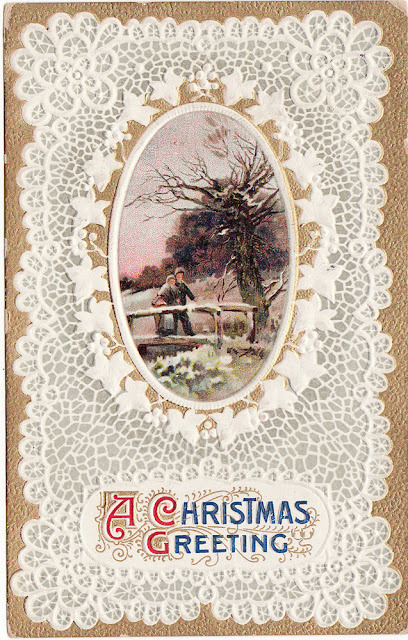 Some new Christmas and New Years items added to the shop, including a beautiful handmade card from 1915. What a wonderful card. I like doilies and lace. I always wonder about the people ... wonder what Aunt E did to her arm and when she'll be able to comb her hair again!!!!! Happy PFF! How truly wonderful! May I add this one to my cyber collection? Happy PFF, and Merry Christmas! Sure, Beth! Glad you like it. Wonderful card, and great sentiment too.